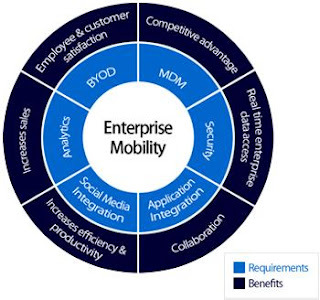 Enterprise Mobility is a hot topic these days. It is a big buzzword, right there in the same league as Cloud and Big data. There are so many views, articles, journals, blogs, and white papers about why it is good for your business to go mobile. They would tell you to a lot about the mobile strategy- how important it is, how to create one, how to staff one, and even how to execute it. There are others who harp about the benefits of Smartphone technologies, with an elaborate oration about what are your options, feature comparisons, and everything short of making your choice for you. As an enterprise, it is easy to get confused when deciding the best approach for their enterprise mobility management initiatives. Even within your core team, you would have people who want to invest in technology and others who would want to enable functionalities and use cases, which may or may not be relevant to your enterprise. Mobile devices have become the centerpiece of our work and personal lives. These tiny and flashy devices are forcing all businesses to create enterprise mobility strategies and inspiring early adopters to launch innovative, mobile services for employees, customers, and business partners. With the continuous increase of enterprises using mobile applications to enhance clients’ satisfaction and worker productivity, it is essential to evolve your business into the next generation of technology usage. So it is also imperative to secure mobile devices as your business also running in it. Enterprise Mobility Service helps employees to have quick access to resources or information whenever they need. People are fundamentally changing the way they work, and in order to remain competitive, organizations are making enterprise applications accessible through mobile devices. The use of mobile computing in business today goes far beyond e-mail access, messaging services, and horizontal applications. Today, almost every employee uses their personal devices at work. They prefer to use smart devices at work to access business information is growing rapidly. The increasing productivity and profitability are driving the demand for Smartphone and tablets within the workspace. There are multifarious researchers held time to time, which tells that half of the employees used their personal devices for office work while on vacation, some people used the mobile devices or tablets while driving and even on the bed too. The integration or personal devices such as Laptops, Smartphone, and Tablets with their apps and software make it easier for employees to collaborate and communicate with staff, customers, and vendors. Mobile devices have become an indispensable part of consumers’ lives. Browser equipped Smartphone and tablets have all the functionality of computers, but they work anywhere- in the home, in a car or in the aisle of a store. Enterprise Mobility Management brings with it the convenience of a size of a handheld device as well as the savings from cost. Furthermore, mobile devices enable consumers to engage in multifarious commerce-related activities, which is great for them. Business organizations have to make sure that when implementing enterprise mobility solutions, they are able to secure the business network and provide different layers of encryption so that only authorized individuals are able to access the company network and database. In order to do so, they would need to hire the services of a reputed IT firm which has a lot of experience in providing efficient enterprise mobility and security solutions.